Teak (tectona grandis)is the ultimate hardwood for long life and weather resistance. The furniture can be left outside all year and does not need to be treated unless for aesthetic purposes. Routine maintenance is simply a scrub down with soapy water and a stiffbrush to remove dirt and algae. Ash is an extremely hard and strong wood often used to make tool handles and baseball bats. Not as durable as teak but has different characteristics. We would recommend routine maintenance and the use of preservative oils to maintain. Pine is a softwood so has a limited shelf life outside. Our pine is pre aged with a coating of charcoal and oil but if items areto stay outside all year we would recommend treatment with a preservative. We use marine 316 Grade stainless steel for marine and coastal environments and 304 Grade, more commonly used for garden furniture. Both are hardwearing and resistant to the elements but do benefit from regular cleaning and maintenance. Aluminium is lightweight and for this reason, we have included it in our range. It is used as a frame for the woven furnituremainly but also in other areas where we want a mix of material or additional strength. We powder-coat the aluminium to prevent oxidation and ensure it gives long service. Polypropylene is a lightweight, high strength material resistant to oxidisation and UV. 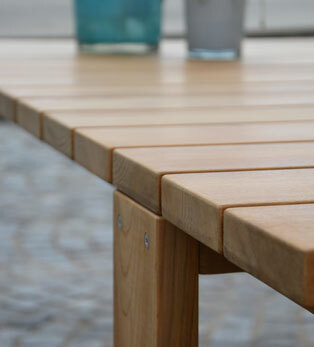 It is processed in many different colours and shapes and this makes it an ideal material for outdoor furniture. Textylene fabric made from PVC coated, polyester, non-stretch yarn, means our slings are strong and durable as well as mildew resistant, flame retardant and low maintenance.